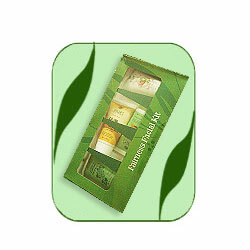 Experience the power of herbs for a visible fairer and glowing skin. This exclusive kit consists of products specially developed to help reduce the production of melanin. Melanin is the pigment in the skin which determines a person's skin colour. Each product has been produced scientifically using the state-of-the-art manufacturing processes to help maintain the therapeutic properties of herbs thus ensuring optimum results. A unique face wash developed scientifically using precious herbs with natural Vitamin E which deep cleanses the skin, makes skin glow and visibly fairer. Moisten face. Squeeze out a small amount on your palm. Massage gently on the face and neck. Rinse well and pat dry. Grape seed ext, Aloe Vera ext, Olive, Vitamin-E & Orange peel ext. A unique formulation that helps to discover a new kind of luminosity day after day. This mud based scrub is a deep pore cleanser that wipes away spent surface cells, revealing a smoother, clearer and refined complexion. Moisten face & neck. Apply the scrub all over face and neck. Massage gently with fingertips for 2-3 minutes and leave on for five minutes. Rinse thoroughly and pat dry. An exclusive face pack that helps to reduce the production of melanin, improve skin texture & brings glow to the skin. Wash face and pat dry. Apply a thick layer on face & neck. Leave on for 20 minutes. Rinse thoroughly with plain water. Bearberry ext, Liquorice ext, Arbutin ext, Multani Mitti, Calamine. A natural skin whitening formulae from Jovees developed scientifically contains skin lighteners derived from natural sources that help to reduce the production of melanin, provide deep down moisturising, clarifies the skin, gently even-out discoloration, brings glow to it. It shall also protect skin from harmful effects of UVA and UVB rays. Apply all over face and neck twice a day and leave on. Saffron ext, Bearberry ext, Vitis vinifera ext, Scutellaria baicalensis ext, Saxifera ext, Nigra root ext.